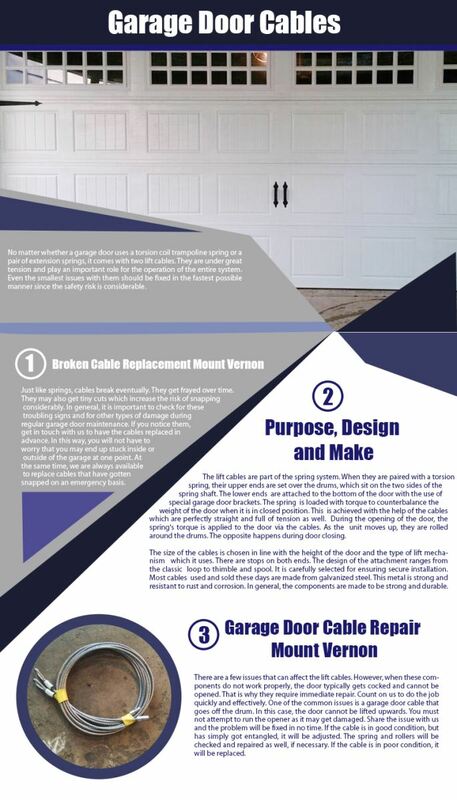 Take advantage of our handy guide to garage doors by checking out our infographic page. The overhead door of your garage opens and closes normally thanks to the torsion spring lift mechanism. The spring is set over a specially designed shaft positioned above the door. It is loaded with torque matching the weight of the door. During the opening of the door, the torque is released and applied to the drums. The cables connected to the drums use the torque to lift the door up. This is a reliable mechanism, but due to the hard work which it does it has a fairly high rate of wearing. Issues such as noisy operation are typically due to lack of proper lubrication. If the spring appears to be worn and/or the cables are frayed, it is time for replacement. Count on us to do this job professionally and swiftly. Other issues such as cable off the drum are also resolved without delay via our garage door repair service.